The name John Coltrane is probably familiar to rock fans, but how many of you actually have ventured out and listened to any of his recordings? In addition to his solo works, he has appeared with Miles Davis, Jimmy Smith, Dizzy Gillespie, and Thelonious Monk, and he is a highly regarded tenor saxophonist. Coltrane has influenced quite a few rock musicians as well, including Jerry Garcia and Carlos Santana. In fact, it wasn't unusual for Coltrane's music to be played over the P.A. between sets at a Grateful Dead show. The influence that Coltrane has had on Garcia is monstrous. Coltrane's 1960 release Giant Steps provides the perfect entree into his canon. Recorded in 1959, this is the first album comprised entirely of Coltrane originals. Seven tunes appear on the album, and the CD contains an additional five alternate takes of those songs. Don't let the academia scare you, though. You really don't need to know a thing about theory to enjoy Coltrane's playing, and throughout Giant Steps, he pushes far beyond technical proficiency. 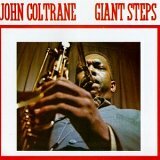 Giant Steps is really a traditional four-piece jazz band album, consisting of tenor sax, piano, bass, and drums. Most of the effort is up-tempo with the exception of the pretty ballad Naima, which was written for his wife. What makes Giant Steps stand out, however, is the music that emanates from one of the most influential and extraordinary saxophonists of all time. and it is available from Barnes & Noble. To order, Click Here!